There are three Agoras in downtown Athens. One is the Ancient Agora where the Thission building is, below the Acropolis and the hill of Areospagos. Then there is the Roman Agora near the Tower of the winds in the Plaka. Both have been closed for centuries though tourists can pay an admission fee and walk the ancient streets where Socrates and Plato used to walk, and see remnants of the ancient stoas, buildings and statues. But the Agora on Athinas Street, otherwise known as the Athens Dimotiki Agora (Public Market) or Varvakios Agora is my favorite of the three and even when I am not shopping (how much meat and fish can you cook when you live in a hotel room?) I seem to get energized walking around. 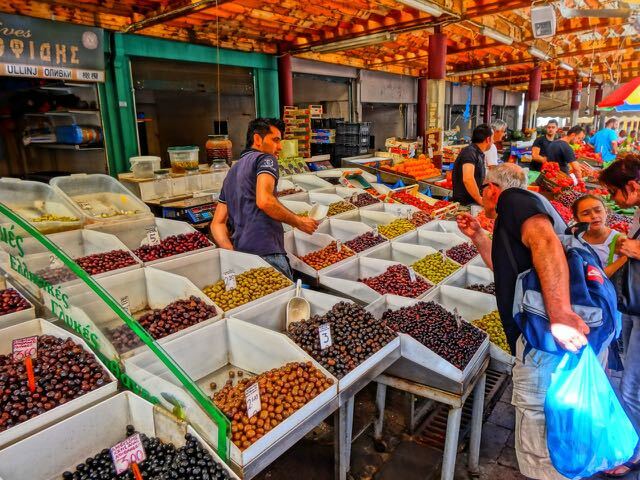 To me the Varvakios Market is the most exciting place in Athens and I can't recall a trip to Greece that I did not take a walk through the covered streets. If you are coming from the Monastiraki Flea Market and continue from Monastiraki Square down Athinas street towards Omonia you will pass the Hotel Attalos on your left and a block later the Hotel Cecil. When you get to Evripidou street you will find yourself at the Agora, Athens Public Market, bordered by Athinas, Evripidou, Eolou and Sofokleous Streets. Morning is the best time to be here. It's often a mob scene but lots of fun and a reminder that the true wonders of Athens may not be in the dead past but in the very alive present. 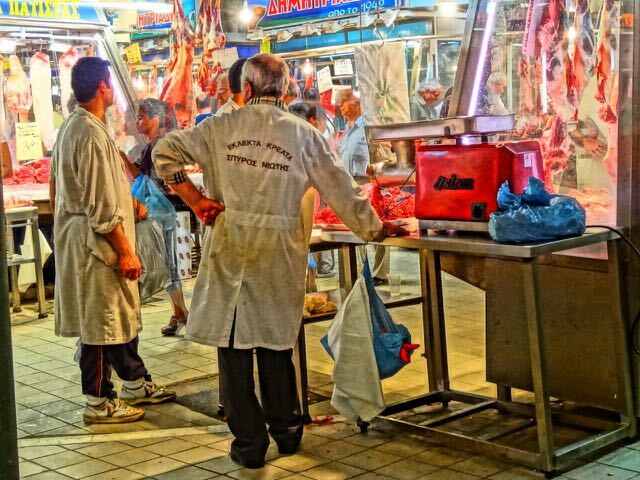 Some of the butchers come from generations of butchers who have had stalls in the market for a century. In the last few years the EU has made the market comply with their standards and now meat is kept cool in refrigerators and the whole market got a facelift. But the atmosphere is still the same and the experience is certainly what shopping was meant to be. The Fish market is my favorite part. Wear shoes, not flip-flops. The ground is kind of wet and fishy. 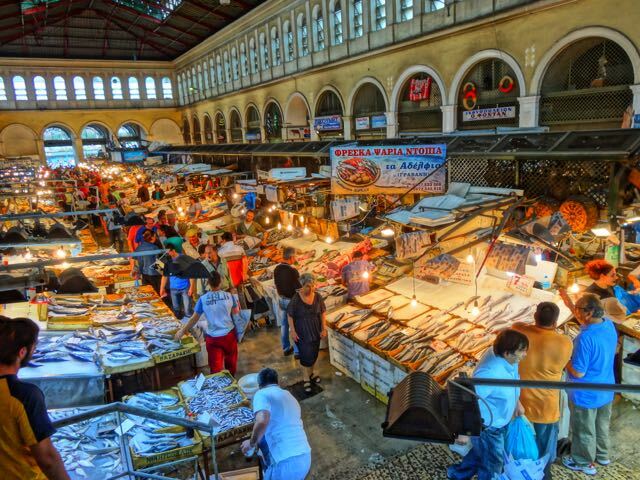 Wander around and look at all the fish, some fresh, some frozen, and listen to the voices of the merchants as they call out their prices. For some reason the pigs feet are in with the fish and I have not understood that but if its OK with the fish then it is OK with me. Any fish you can find in the Aegean and even some imported from as far away as China, Portugal and North Africa are here. 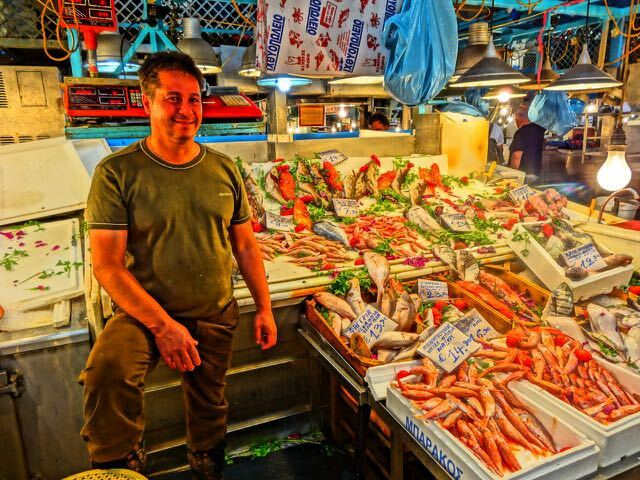 You will know what fish are in season and what to order in the restaurants after a short walk through the fish market because those will be the fish that there will be the most of and will drop in price as the day gets later. I guarantee you will be impressed by some of the creatures of the deep on display. You will also be surprised at the variety and the noise. Fish venders know how to shout. I often see the owners of restaurants I go to, shopping for the freshest fish. Surrounding the fish market on three sides is the meat market and across the street are the fruits and vegetables. The weirdest animals are found in the meat section closest to Omonia, though this depends on the season. I have seen giant woolly animals that looked like either a giant wild boar or a mastodon. But mostly you will see the kind of meat that you will recognize from your shopping at home, only bigger parts and probably a lot healthier then the meat you get. Like in the fish market there are signs that tell you what kind of animal it is and where it comes from. 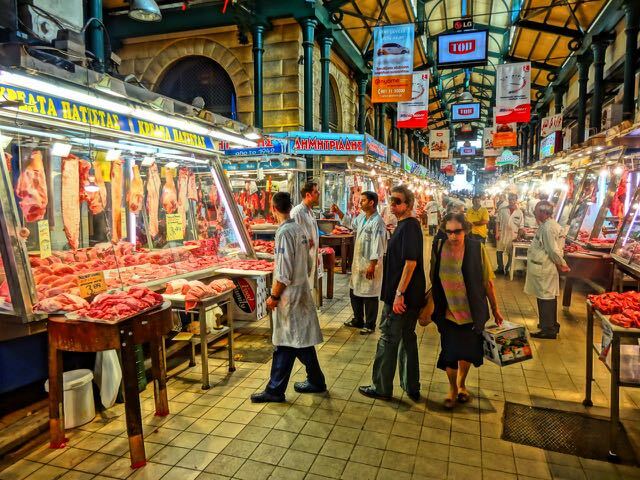 Mostly you will see beef, pork, lamb, goat, chickens and an occasional rabbit, plus entire tables with organ meats like livers and kidneys and the intestines and other ingredients for making patsa and mageritsa. If you are hungry visit the two working class restaurants in the meat market and the secret underground restaurant at the bottom of the vegetable market by the olive shops where wine appears on the table whether you ask for it or not and the menu is in the guys head or you order by pointing on whats on the next table. 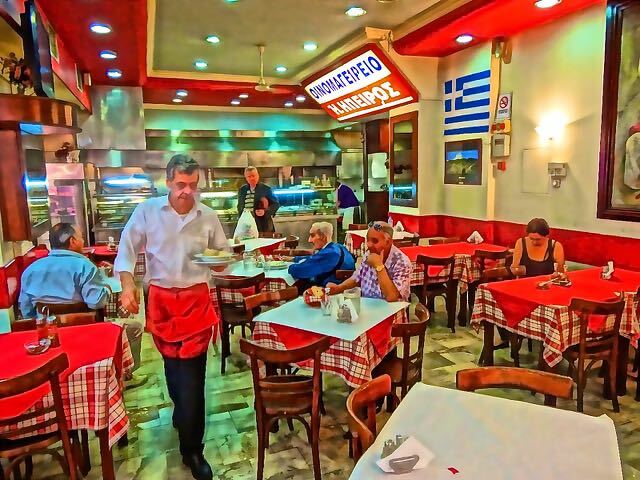 There are several restaurants and fast food places in and around the market including some old ouzerie-cafeneons and an old Rembetiko cafe called The Stoa Athanaton where you can see Rembetika legends at their afternoon matinees or at night. The restaurants within the meat market are inexpensive and though you may be a little intimidated by the lack of a touristy atmosphere you will feel at ease when you are eating your roast lamb and potatoes, fricasse, bean soup, or a podi, the soup made from the foot of a cow which actually contains a foot of a cow. I go to Eiprus restaurant, sometimes even for breakfast. Nope you can't get eggs-over-easy or any eggs at all but you would be surprised how good a bowl of fish soup tastes early in the morning. Don't forget to try the Patsa a cure for hangovers, indigestion, bad blood or eating. Right around the corner is Papandreou which like Epirus has been open for decades or more. In both restaurants you point at what you want and it comes to the table. T here are also a couple of very good souvlaki shops right on Athinas. 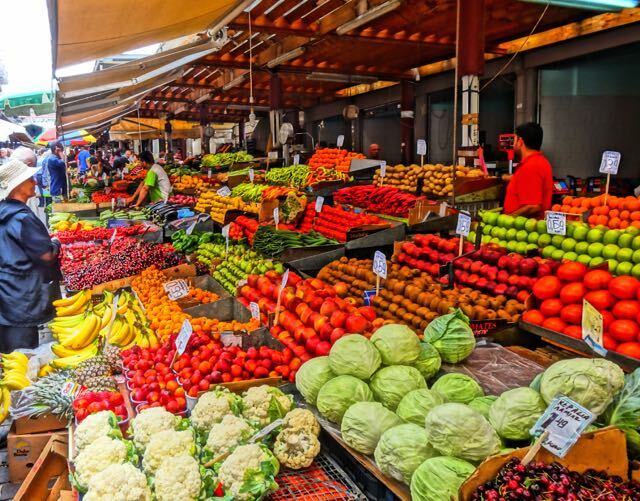 Across the street from the fish and meat market is the fruit and vegetable market where you will find the biggest lemons, peaches and some of the most colorful fruit you will ever have seen. There are also Russians and Greeks who have returned from the former eastern block countries selling cigarettes, tissue paper, lighters and just about anything. There is a Polish food shop, like a deli on the right hand side as you walk towards Sokratous Street. You will also pass shops that sell nothing but eggs, or feta cheese and some shops that have smoked meats and sausages. There are also people from the villages who don't have stalls, just sitting on a box, selling wild herbs, or wild greens from the mountains, or garlic. At the bottom of the fruit and vegetable market is the beginning of Athens' China town which is also India town, Pakistani town and also the Arabic section of the city. If you are a big goofy American in Bermuda shorts and a camera that looks like the caricature of a tourist you may feel a little uncomfortable wandering around these back streets though the dangers are few and don't have anything to do with being kidnapped, murdered or worse. Evripidou Street is one of the most interesting and diverse shopping streets in Athens. 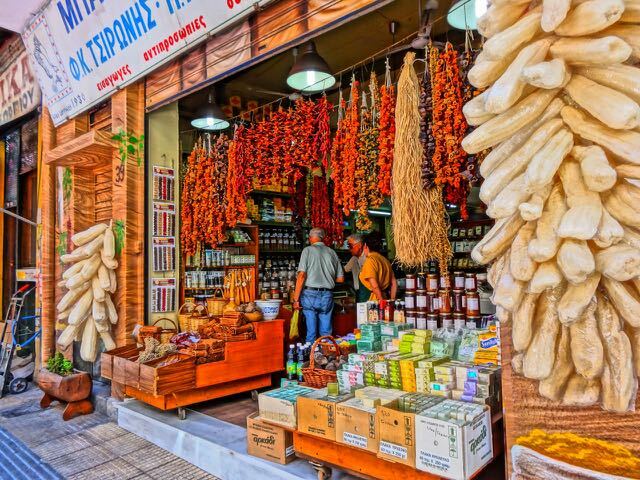 There are plant and seed stores, the excellent herb and spice stores including the popular Elixer, where you can find herbs you have never even heard of as well as spatholatho, the oil the ancient Greek soldiers used to use to heal their wounds. Next door is Arapian, a Armenian butcher that specializes in sausages, pastourma and souzouk among other things. Buy their spiciest souzouk and take it home. They will vacuum pack it for your trip. There are many ethnic stores and barbershops, that cater to their clientele from the east. There are Indian restaurants and the famous Telis, which serves only grilled pork-chops, fried potatoes and salad. If you go back and cross Athinas Street and you continue past the side entrance of the meat market you will come to Eolou Street which is one of Athens' primary pedestrian shopping streets which can lead you to Omonia Square and all the way to the National Museum or back towards the Plaka, Monastiraki and the Acropolis. Going up Evripdou Street away from Athinas Street will take you to Klathmanos Square where you can go up Stadiou street to Syntagma. There are a couple interesting hotels in the area for example the ultra modern and popular Fresh Hotel where Jamie Oliver stayed while shooting his Greece episode. 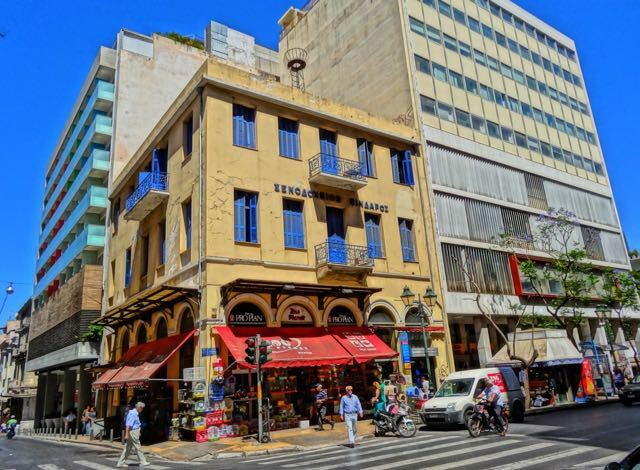 There are a number of older hotels in historic buildings that are either refugee centers, bordelos or both though some of these are being renovated to keep up with the new demand for centrally located hotels in Athens. If you want to stay by the market your best bet is the Hotel Attalos because it is also convenient to Monastiraki, Psiri and the Plaka. The hotels on the back streets and going towards Omonia are cheap but at night the streets are dark and a little scary. The Hotel Economy is right by the fruit and vegetable market and as its name implies is relatively cheap. The Athens Center Square is actually right in the market. The Athinaikon Hotel was one of those old bordello/flop houses that was totally renovated and is right on Evripidou Street. The Hotel Arion is right in Psiri a few steps from the tavernas and a block away from the Athens market. If you keep walking down Athinas street it will eventually lead you to Omonia Square .